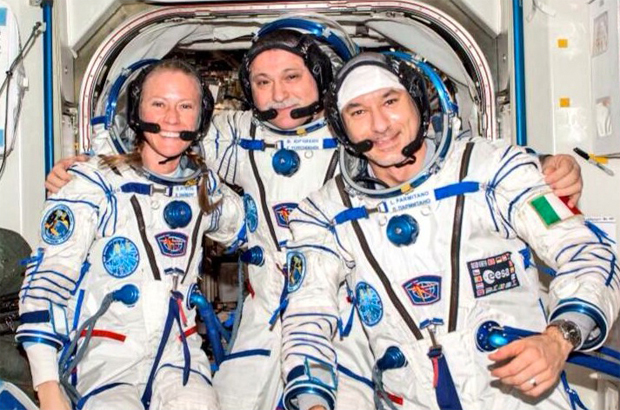 Three station fliers strapped into their Soyuz TMA-09M ferry craft, undocked from the International Space Station and plunged back to Earth Sunday, settling to a jarring rocket-assisted landing on the frigid steppe of Kazakhstan to close out a 166-day stay in space. Packed safely away in the Soyuz spacecraft was an Olympic torch that was launched last Wednesday with another three-person crew and carried outside the station Saturday for a dramatic spacewalk photo op. Olympic organizers plan to use the torch in the opening ceremonies of the 2014 Winter Games in Sochi, Russia. Within minutes of touchdown, Russian recovery crews converged on the spacecraft to help the returning station crew out of the cramped descent module for initial medical checks and satellite phone calls to friends and family back home. 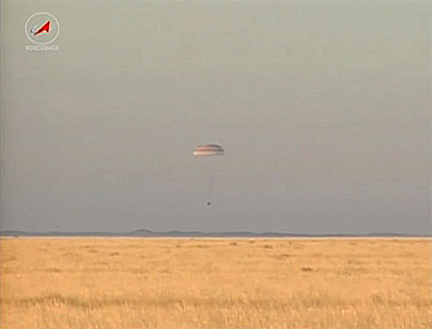 The Olympic torch also was pulled from the capsule and shown on live television from the landing site. 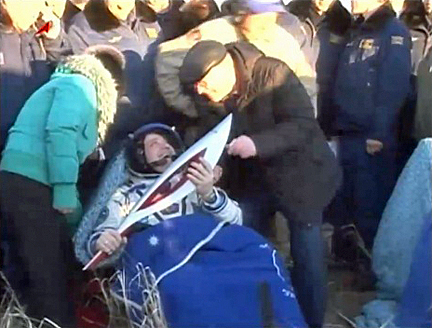 The Soyuz descent module ended up on its side, but commander Fyodor Yurchikhin, European Space Agency flight engineer Luca Parmitano and NASA astronaut Karen Nyberg appeared in good health as they relaxed in nearby recliners, covered by blankets to ward off sub-freezing temperatures. Yurchikhin held the Olympic torch throughout the initial recovery operation, posing for photographers and carefully waving it about. 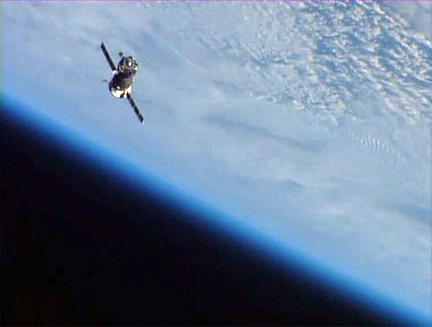 The trip home began at 6:26 p.m. EST (GMT-5) when the Soyuz TMA-09M spacecraft undocked from the aft port of the space station's Zvezda command module. Yurchikhin monitored the undocking from the cockpit's center seat, flanked on the left by Parmitano and on the right by Nyberg. 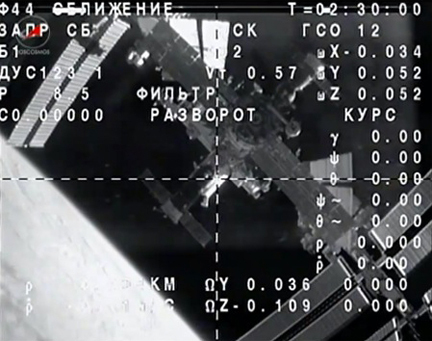 "We are feeling the separation," Yurchikhin radioed as springs in the docking mechanism pushed the Soyuz away. "Have a good flight," someone called. "Thank you, thank you all." After moving about 12 miles away from the lab complex, Yurchikhin monitored an automated four-minute 45-second rocket firing starting at 8:55 p.m., slowing the craft by about 286 mph, just enough to drop the far side of its orbit deep into the atmosphere. About three minutes before atmospheric entry at 9:26 p.m., the three modules making up the Soyuz spacecraft separated with the central crew module lining up heat shield first as the crew prepared for the most dynamic phases of re-entry. The descent module's braking parachutes deployed at an altitude of about six-and-a-half miles, 14 minutes or so before a jarring rocket-assisted touchdown at 9:49 p.m. to close out a flight spanning 2,656 orbits and 70.3 million miles since launch on May 28. Asked what he was looking forward to the most with his return to Earth, Parmitano, a father of two young girls making his first flight, told reporters Friday his priorities included "family, then espresso, pizza and everything else." "Even though I'm ready to come back and it's great to think about seeing my family again and feeling the warmth of people and human contact, I think I will very much miss this environment," he said during an orbital news conference. "It's hard to identify one thing. I will miss everything, really, because station was my home for the past six months (and) there's never a time to get bored. And the most beautiful view you can think of. "What I'm going to miss about everything is the idea of being here, living weightless in this extraordinary world. The view, obviously, is something that I will always bring with me. The physical sensation of being weightless is something I think I will miss immediately." Nyberg, a shuttle veteran, said she was looking forward to a "wild ride" home aboard the Soyuz. "More than anything, of course, I'm looking forward to seeing my husband and my son," she said. About 90 minutes after landing, after more detailed medical checks in an inflatable tent, Yurchikhin, Parmitano and Nyberg were to be flown by helicopter to Karaganda, about 236 miles from the landing site, for a brief welcome home ceremony. From there, Nyberg and Parmitano planned to fly back to Houston aboard a NASA jet while Yurchikhin headed back to Star City near Moscow aboard a Russian aircraft. With the completion of the Soyuz TMA-09M mission, Yurchikhin's time in space stands at 537 days over four missions while Nyberg's two-flight total comes to 180 days. Left behind in orbit were Soyuz TMA-10M commander Oleg Kotov, flight engineer Sergey Ryazanskiy and Michael Hopkins, along with Soyuz TMA-11M commander Mikhail Tyurin, flight engineer Rick Mastracchio and Japanese astronaut Koichi Wakata. Tyurin's Soyuz TMA-11M crew was launched last Wednesday, ahead of schedule, in order to get the Olympic torch up to the space station for a spacewalk photo op and a quick return to Earth with Yurchikhin's crew. Kotov and Ryazanskiy took the torch outside Saturday and posed for publicity shots, staging a symbolic torch relay, before bringing it back inside. The torch now will be turned over to Olympic organizers who say it will be used to light the Olympic flame during opening ceremonies in February. A few hours before Yurchikhin's crew departed, the combined nine-member crew held a change-of-command ceremony, with Yurchikhin, commander of Expedition 37, handing the station over to Kotov, who now leads Expedition 38, which is made up of the Soyuz TMA-10M and TMA-11M crews. "It's a great day for us because we have the road to home," Yurchikhin said, speaking in English. "But each day, maybe each night, we will have a dream to return here again, to see our guys, our friends. ... We know the station is now in great, strong hands, and very smart, very international." 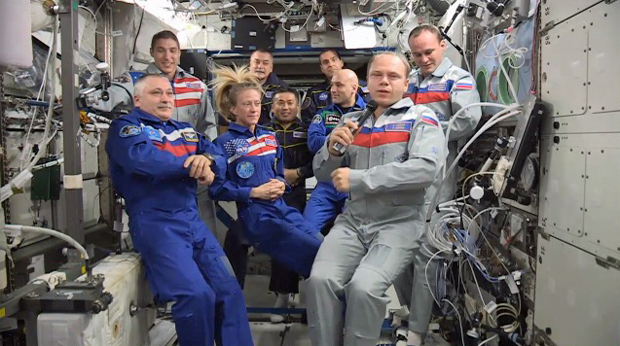 For his part, Kotov thanked flight controllers around the world for their support and reported the "station is in really good shape and everything is just awesome." "I'm really glad to assume command of the station and looking forward to working with you ... and all MCCs (mission control centers)," he said. "Thank you for your support, and Expedition 38 now (is) on the station." This was only the third time in station history that the lab has hosted nine crew members in the absence of a space shuttle.